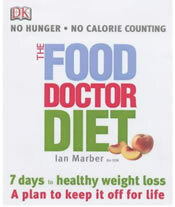 The Food Doctor program was established in the UK by clinical nutritionist Dr. Ian Marber. Marber realized that low calorie and high protein diets were not producing long term results for his patients so he designed a diet to include all the food groups so as to increase energy and promote optimal health. Marber claims that his program “allows healthy, sustainable weight loss which is easy to maintain”. Marber has made his program available through the Food Doctor series of books which include meal plans, recipes and menus. He promises results within a month of following the program. Also available for shipping throughout the UK is the Food Doctor range of fresh foods and healthy snacks which include high fiber breads, cereals, seed mixes, soy nuts and food bars. A range of healthy ready meals are available which are each designed to contain the perfect combination of protein, carbohydrates, fiber and essential fatty acids. Some of the options include Atlantic salmon with wild rice, flame grilled chicken with quinoa pilau and roast butternut squash with chickpeas. Marber has outlined 10 basic principles that are the foundation of the diet. Instead of focusing on the calorie content of foods dieters are encouraged to think of foods in terms of their nutritional value. Marber explains that many low calorie ‘diet’ foods often have a high glycemic index which disrupt blood glucose and can trigger cravings and overeating later in the day. Marber also explains the ideal ratios of protein to carbohydrates for each meal and outlines examples of how to create meals that will keep the blood glucose level stable. For lunch he advises 40% protein, 40% vegetables and 20% complex carbohydrates. Dinner is 50% protein and 50% vegetables and does not contain complex carbohydrates. Protein – chicken breast, skinless turkey, eggs, fish, raw nuts, legumes, tofu, veal. Complex Carbohydrates – brown rice, couscous, quinoa, whole grain pasta and bread. Essential Fatty Acids – raw nuts and seeds, oily fish, avocado, pumpkin, walnut, olive and sesame oils. An evening snack is not suggested. Instead Marber recommends that a few mouthfuls of the evening meal are saved for a couple of hours later when feeling hungry. The Food Doctor program regards exercise as an essential aspect of any healthy lifestyle program and recommends a minimum of 30 minutes of exercise three times a week. These exercises can be used with the Food Doctor Diet. The initial cost for the online personal nutrition plan is 24.95 pounds sterling with an optional monthly subscription thereafter of 9.95 pounds sterling. NOTE: The US on-line program has been discontinued. The Food Doctor series of books vary in cost from 11.99 – 24.98 pounds sterling. No deprivation and plan is flexible. Sustainable long term lifestyle approach to weight loss. Solid program based on proven and supported nutritional principles. If following online program the plan is individually customized to specific nutritional needs. More expensive than some other diets. If you are willing to outlay the additional expense of the online program the customized nutritional plan may provide that extra boost to your energy and health by addressing your unique nutritional requirements. However the general program outlined in the Food Doctor books is also a very nutritionally sound approach as well as being a flexible program that can be easily sustained as a healthy lifestyle weight loss plan. Whilst living in the UK for 3 years upto 2005 I followed this diet religiously with a few swimming sessions a week. I looked and felt great and it was really so simple once I understood the basics of what I was putting in my mouth. 5 years later I regret stopping as I’m the heaviest I’ve ever been and jogging 3x a week does nothing for my weight. So I’m glad I found this again as it all the motivation I needed. The Food Doctor plan really works. It’s really more about educating yourself about food rather than other “quick fix” diets. Although he does do a 7 day diet, which is a great kick start and detax. I’ve done this twice now and each time lost 7 lbs in a week. Mostly though, it is a plan for eating healthily and he provides great recipes so you still enjoy what you’re eating – Thanks Food Doctor!